The opposite of the vertical line, the horizontal line represents matter, and the forward and backward movement of time. This line also signifies the skyline or horizon and man’s place on the Earth. There’s something about a horizontal line in an image that conveys a message of ‘stability’ or even ‘rest’. Horizons, fallen trees, oceans, sleeping people – all of these subjects have something about them that speaks either of permanency and timelessness or rest. Horizons are the most common horizontal line to be found in photographs and they often act as a dividing point in a photograph – in effect an anchor that the rest of the image is formed around. 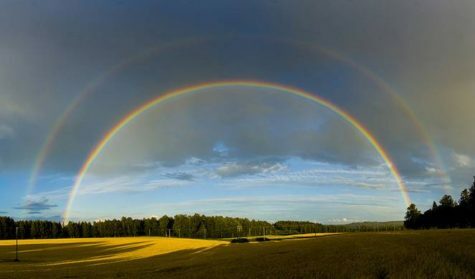 Perhaps the most prominent arc of the natural world appears in the elusive form of the rainbow, which primitive man saw as a bridge between the Heavens and the Earth. As part of a circle, the arc symbolizes potential spirit. The position of the arc is important. Upright, shaped like a cup or chalice, it implies the feminine principle, something that can contain the spirit. If the arc is inverted, then the opposite is true and it becomes a triumphal, victorious, masculine symbol. As such, the arc can take the form of an archway. The vaulted or arched shape of many holy buildings, from a great variety of different faiths, represents the vault of the Heavens. The arc shape often appears in planetary symbols. Effectively an expansion of the dot, the circle represents the spirit and the cosmos. Further, the circle itself is constructed from “some thing” (the unbroken line) and “no thing” (the space inside and outside this line). 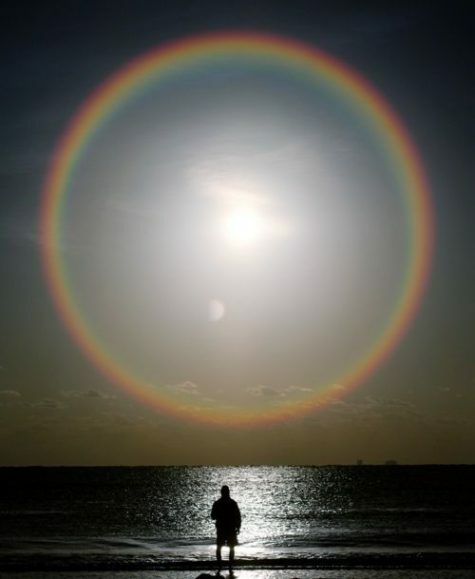 Therefore the circle unifies spirit and matter. The structure itself has great strength – think of the cylindrical shape of a lighthouse, built that way in order to withstand the fiercest attack by a stormy sea. The physical and spiritual strength of this symbol are there because the perfect circle has no beginning and no end; it is unassailable. This power is why the circle is used in magickal practices such as spell-casting. The magick circle creates a fortress of psychic protection, a physical and spiritual safe haven where unwanted or uninvited entities cannot enter. Where would ancient man have seen the most important circles? Obviously, in the Sun and the Moon. 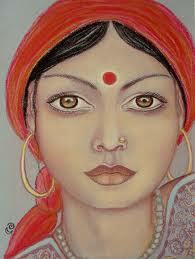 As the Sun, the circle is masculine, but when it is the Moon, it is feminine. Because the passage of time is marked by the journey of the Sun, Moon and stars in orbit around our Earth, the circle is a symbol of the passage of time. In this form, it commonly appears as the wheel. Because the circle has no divisions and no sides, it is also a symbol of equality. King Arthur’s Round Table was the perfect piece of furniture for the fellowship of Knights who were each as important as each other. Similarly, the Dalai Lama has a “circular” Council. 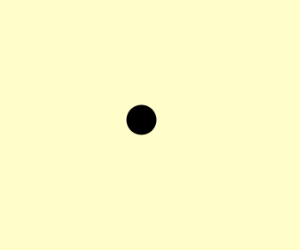 A dot might seem to be an unassuming little thing, the first mark on the pristine sheet of paper. In this case, the dot is a beginning. But see what just happened there? The dot, an essential component in the structure of the sentence, closed it, making it a symbol of ending. Therefore, the dot is both an origination and a conclusion, encompassing all the possibilities of the Universe within it, a seed full of potential and a symbol of the Supreme Being. The dot is the point of creation, for example, the place where the arms of the cross intersect. The dot is also called the bindi, which means “drop.” The bindi is a symbol of the Absolute, marked on the forehead at the position of the third eye in the place believed to be the seat of the soul. The presence of dots within a symbol can signify the presence of something else. A dot in the center of the Star of David marks the quintessence, or Fifth Element. It also acts as reminder of the concept of space. The decorated dots that surround the doorways of Eastern temples are not merely ornamental devices but have significance relevant to the worshipers. Dots frequently appear in this way, acting as a sort of shorthand for the tenets of a faith. In the Jain symbol, for example, the dots stand for the Three Jewels of Jainism. The dots in each half of the yin yang symbol unify the two halves: one dot is “yin,” the other “yang.” Together they demonstrate the interdependence of opposing forces. The elements of a symbol are defined only by the space that is a part of its construction. Like the wind, the effect of space is gauged by its effect on the things within it,or surrounding it. The concept of space, the void, is a profound part of our experience. 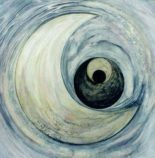 To reach a state of “emptiness” is, for many, the ultimate spiritual experience and a way of connecting to the Absolute. When John Lennon wrote “imagine,” whose lyrics gradually strip away the trappings of the material world, it was this idea that inspired him. To be aware of the possibility of space within a flat, two-dimensional representation is to give that shape substance and a new kind of reality that lifts it off the page and makes it real. Space is not flat and cannot be confined by lines on a piece of paper. The page and the shape on it do not exist in isolation, but are a part of a greater cosmos. This web page and you, the reader, are a part of this equation. The concept of zero is a space. Indeed, the realization that “nothing” can be “something” marked a profound leap forward in man’s development. All creation myths begin with a Void, symbolic of potential. Although attempts to explain the concept of space are inevitably faulty, it might help to think of a blank page. Before a mark is made upon the paper, the potential for what might appear there is so vast as to be unimaginable, a consideration which causes consternation for some artists and writers. Without this space, there is no arena for anything else to exist. The absence of any thing means that no thing is the most important symbol in the World.